Leury Garcia reacts after hitting an RBI double that brought the White Sox within one run. 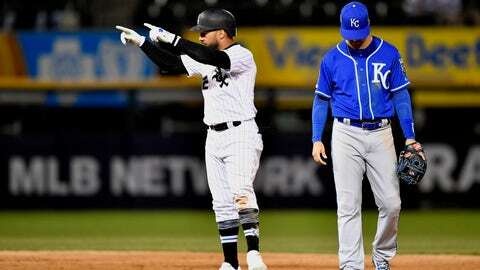 Castillo’s poor throw on Billy Hamilton‘s steal in the seventh helped set up Whit Merrifield‘s tiebreaking sacrifice fly. But Castillo came up big after Tim Anderson led off the eighth with a double against Brad Boxberger (0-3), sending an opposite-field drive to right.